This Greek inspired lemon orzo soup recipe with chickpeas and dill is super easy to make and will be ready in 30 minutes! Heat oil or water over medium heat, add onion and carrot, saute for about 5 – 7 minutes, add the garlic and saute for 1 minute more. Add the broth or water, bring to a boil, add the orzo and chickpeas, reduce heat to medium-low and cook at a gentle boil for 8- 9 minutes, orzo should be tender. Remove from heat, add tahini and lemon juice, stir well. Add the baby kale or spinach, give a good stir, greens will soften and wilt within a few minutes. Add as much dill as you like, and season well with salt & pepper. Soup will thicken upon standing, add more liquids as needed. Serve in individual bowl with your favorite crusty artisan bread for soaking up the wonderful juices. The tahini adds a delicious buttery creaminess. If you don’t have tahini on hand, this soup will still be fantastic! Replace the tahini with 100% cashew butter, on that is free from additives such a sugar, salt, and/or flavorings. For the broth, I prefer to use a combo, usually half broth and half water. To keep the sodium to a minimum, source out low-sodium vegetable broth. I almost always use this organic vegetable broth concentrate – for this recipe I would add about 1 heaping teaspoon to 4 cups of water, and than use 3 – 4 cups of plain water. It works well, without losing out on too much flavor. The herbs can be changed up to suit your taste. If don’t care for dill, try using rosemary or oregano. 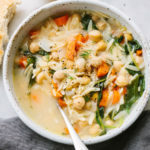 To make this soup gluten-free, use 2 cups cooked rice in place of the orzo and reduce the liquids to 6 cups, adding more as needed.